After returning from a tour of duty during the war in Afghanistan, Alex Seymour needed a way to cope with the extremes he experienced as a member of the Royal Marine Commandos, losing 7 men in his unit, and having his best friend critically injured by a Taliban bomb. Drawing upon his pre-deployment experiences with DMT and psilocybin mushrooms, Alex knew that entheogens could help him release his fears and traumas. But he also knew that simply taking psychedelics wasn't enough--he needed ceremony, something sacred to draw meaning from his experiences, to help him reassess not only the war and his role in it, but his entire life. So he set out for the Amazon in search of the hallucinogenic brew known as ayahuasca and a shaman to guide him. The result is a crazy, page-turning adventure where he journeys deep into the jungle and himself. "Excellent, thought-provoking, important, and gripping, it's the best book on the ayahuasca phenomenon in a very long while. A truly original and authentic account." 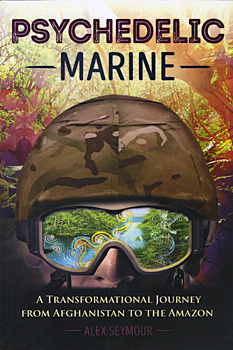 "I saw my life and my own path from the marines to the jungles of the Amazon in every page of this book. This infantryman approves! Semper fidelis!" "This book offers crucial insights into how psychedelics can both heal PTSD and facilitate the universal mystical experience that breaks down the 'us and them' dichotomies that often lead to war. Highly recommended." Alex Seymour enlisted in the Royal Marines Commandos as a teenager, serving for 6 years and completing 2 tours of duty on active service. Twenty years later he returned to the service as the oldest frontline commando in Helmand Province in Afghanistan. He is currently the Technology Account Director for a global technology company and lives with his wife and children in Buckinghamshire, England.